Dress is Summer uniform. No visible jewelry. Hair is to be back. 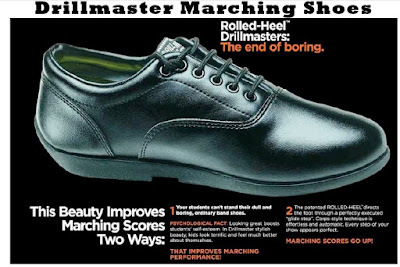 Come prepared to rehearse well before the game. We have lots of new things to review and old ones to fix. Cheers are to be memorized. Stand tunes will be provided. All halftime music should be supremely memorized. We will play part V in the stands 4th quarter. You will have the third quarter off. Please be on your best behavior when out and about. Snacks will be provided for FMB and the visiting band after halftime at the booster concession stand. FMB official pictures will be taken on Friday, September 9 during 7th period and immediately after school. Band members should stay between school and our road trip to Triad so we can get everyone photographed individually, sections, and full band. 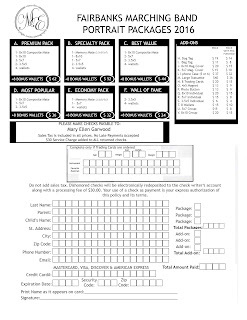 Order forms go home today but you can also download below and print. Make checks payable to "Mary Ellen Garwood." 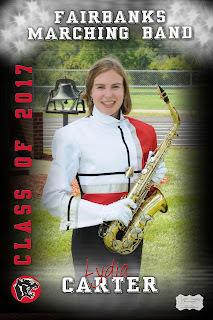 This year's FMB seniors were invited to join in the "Senior Banner" tradition that has been going on in the athletic department so after a photo session, the banners will be ready to go for next Friday's home game. Banners are purchased by the families of the seniors and they get to keep the banner after the season is over. Thanks to Joni Cox for making these keepsakes happen. Parents: You're welcome to download this artwork by clicking on each picture, as per the photographer. *Dress is SUMMER uniform including your band polo, black shorts, white socks, and white-ish shoes. Please do not wear any visible jewelry. Long hair is to be pulled back. *The band room is open and supervised after school. Food will be served. Please be on your best behavior if you are staying after. *Tonight's music is Part 1-4. We will march and play. Cheers are also to be memorized. Stand tunes will be provided for the 4th quarter and do not need to be memorized. *If you are riding home from the game with a parent, you need to give a note to Mr. Keller BEFORE we depart FHS. If you are not riding the bus home, you MUST be traveling with a PARENT. Week of September 12 - Classes begin. Students have band once per week. I have the following members excused for these late additions to the calendar. If I have somehow missed your text, email, or hand-written note, please notify me immediately, otherwise I need all other members to be in attendance. 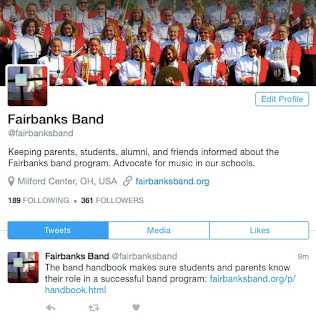 This is the ONE site you need to visit to keep up to date on everything that goes on in the band program. You do NOT have to have a Twitter account to view this page, but if you do join you can use the Twitter app to always stay informed and can also set text alerts so you are alerted immediately when updates are posted. (especially useful for FMB parents who want to know about changes and what time the bus will be back at school). An update is posted any time anything is added to the main fairbanksband.org page as well. Grades In-class worksheets will be worth 5-40 points. Quizzes will be worth 10-20 points. Tests will be worth 40-50 points. Your grade will be the total number of points you have earned divided by the total points possible. The standard grading scale will be used. Extra credit may be given at the Mr. Keller’s discretion. Grades will not be rounded up. No exceptions. Assignments must be turned in on time to receive full credit. No late work will be accepted the week prior to the end of the grading period. Two performances that were not originally on the calendar are being added. These are required events so please adjust accordingly. I realize that not all band members may be able to attend due to the late notice. If you are unable to make either performance due to an unavoidable conflict, please notify me as soon as possible via text, email, or hard copy. All fall sport teams and band will be introduced at the Football Jamboree scrimmage on Friday, August 19. The band will play a brief pre-game performance (not marching). Report time is 6:30 in summer uniform. Members are admitted free to the game and can stay if they choose, but can leave any time after 7pm if they wish. 8:30-11:45am - FMB rehearses at the field, including dress rehearsal. 1:00 - Clean rooms, pack. 4:00 - All keys, cards must be collected. All student rooms must be empty. 5:30 - Full band picture, dismiss. Yes. If your parents are here before the show, not only MAY you load your stuff in their car before the show, but you SHOULD do so if you are able.